Before we started cruising we decided to install a Lighthouse anchor windlass. I purchased the unit from Defender Industries and spent several days doing the installation. 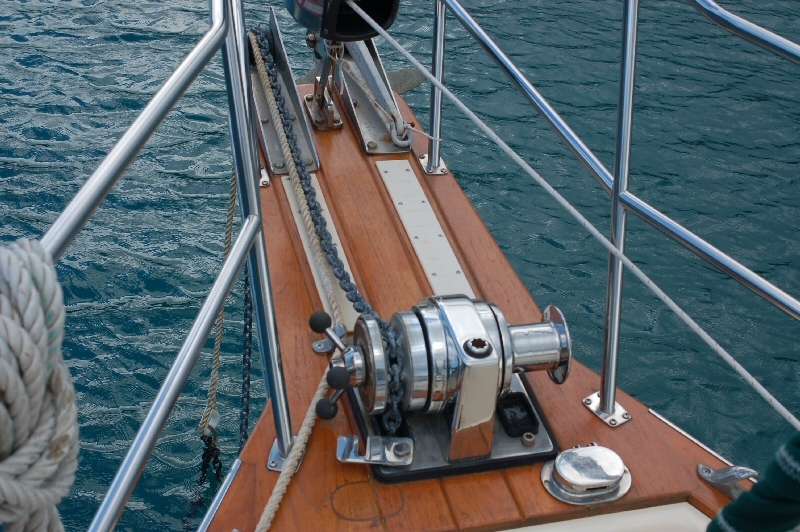 This image shows the windlass and the anchor chain deployed and 3 strand nylon snubber in place. Installation was straightforward, I plugged the old deck fitting on the port side of the bow and then cut a new hole for the anchor chain. The mounting included a heavy duty stainless steel backing plate. The electrical circuitry included only a foot switch for picking the chain up – we’ve found that a free drop of chain from the deck really helps the anchoring process. I fabricated a motor control circuit using a standard automotive (30 amp) relay controlling a heavy current solenoid all mounted in the chain locker..